Nerissa was so kind to award this to us. In accepting this award, I have to say five things about myself. 1- I am all four paws declawed before I came to live with mum. 2- This is my second home. 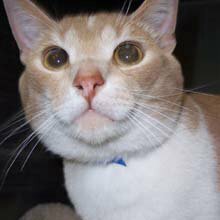 3- I got my name because I was adopted on the first Caturday of May, the day they run the Kentucky Derby. 4- I got the Squillion craze started way back in 2006. 5- I am not a lap kittie, I will sit near mum but not on mum. 2. What is your favourite time of year? Open window time, I love the times when the windows are open and I can inhale all of the wonderful smells from outside. 3. What's the most important thing you want to do? Get Ducky and make him squirm and cry. 4. Who is your favourite person or animal pal? 5. Where in the whole wide world would you like to go? Why would I want to go anywhere, I have it good here. Food and shelter, someone to wait on me. 2 - I am declawed on my front paws, my firsted owners did that to me. 3 - I loves to sit on mum and purr lots and lots. I even sit on top of her at night to sleep. 4 - I can hold my own against Derby even though he is bigger. I am faster and more agile. 5 - I am a jumping fool. I can jump over 4 feet to get on top of mum's corner cupboard. You know who can't! The sunny day times of the year. Make mum smile, she loves me so. No place, there is no place like home. 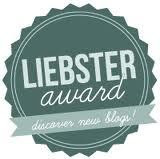 We thinks this award has been around the blogosphere at least once, this is the second time we have gotten it. So if you want it, it is yours. Tell us about yourself. Yep, yesterday it was warms. We did some open window time while mum ated her lunch. She wore a jacket to stay warms inside while we got our whiffs. We didn't have the windows open for long, enough to satisfy our noses. Plus it was way warms, see the temperature thingy? 56F!! Then overnight, it started to cool off and we woked up to the white stuff, just starting to come down. Mum was outside to go pick up the neighbor's paper while they are off cruising around this week. Side of the drive and some grass. About an hour later looking out the front window. Two more hours, looking out the front window. Looking out the back. Don't even see the fevvers around today. So we are doing our best to be all warms today in our snuggle spots. Derby in the little doughnut bed and Ducky under the table by one of the heating spots. It is supposed to get all warms here today. Mum says that means we can probably get the windows open for a bit. This is rare in January around here. It is froggy and rainy, we even had thunder boomy storms overnight! The weather guesser says it may be in the 50's. Last week we were freezing our tushies off. We got a bit of snow and sleet, not much on Sunday. It melted on Monday. Early on Monday there they were guys next door making all sorts of noise. They came and stole most of the neighbor's tree, but they left the bottom 10 feet or so. Not sure why they didn't take the whole thing, or if it is someone else's job to steal the rest of the tree. Mum was outside for a bit in the afternoon and she was behind the house and noticed the just before the sun went behind the house next door it just hits mum's sleepy room window. So from the inside it is just hitting the window frame inside. Welcome back Mr Sun, we likes having you shine in our windows on the back side of the house. P.S. Mum is playing with our blog layout. So if it changes from one visit to the next, now you know. She knows she needs to adjust the header picture. Too much Derby and not enough Ducky! Well, maybe we should make sure we know exactly what this word Vulgar means! This could be part of Savannah's VBP (Vocabulary Building Program)! Guess it depends on which of the five deffy-nitions you want to pull out. Maybe in some case we might be vulgar. We don't lack for cultivation or taste, we are not crude and we always do our best to not use words on the bad word list. We had a changing Sunday. Cloudy all day, then after a ham lunch, it started to snow, then a bit of sleet, but not really the ice they mentioned. That is good. Mum did her chores and got the laundry all done, readed her book. We did this, rested. This is our toy and treat cupboard. Mum says she needs to clear it out soon. Well, missy, see all those nice treats, those need to be cleared to our bellies! Mum says true on that. Otherwise we aren't doing much today. Supposed to get icky, icy weather later in the afternoon. We will stay in and nap. Or bug mum for more treats. How about you? Mum got up late today, well late for her anyway. That is just fine, it is Caturday and she has nothing pressing to do today. So I guess we will all be lazy and nap. Well, maybe mum will read some too. Ducky has taken on the plague ratty to play with for now. Derby doesn't play much with the ratty, so it is all mine. Derby is getting his loves from mum. You bet we are milking the closet incident. We are getting lots of loves and treats this week. Yep, we made it to Friday. For all of us pretty much like any other day. We take naps and just chill out. We are both getting more treats, maybe mum is all guilty for shutting Derby in the closet. Last night we both didn't show up for good night time. So then she had to come looking for us. 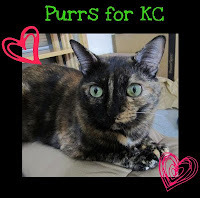 Plus we want to send out HUGE healing purrs to KC. According to a report on The Cat Blogosphere, she has an antibiotic resistant URI. We miss you guys since you moved to MarryLand and we know things haven't been easy. So we send lots and lots of purrs that will give you comfort and know we are thinking about you all. OK, this is not the first time, but mum needs to be more careful. I, Derby the SassyCat, am not amused at all. Monday, mum heads for the sleepy spot, opens the closet and hangs up her floofy, warm robe and crawls in the sleepy spot and covers up. Ducky visits and she says good night, but she doesn't wonder why I didn't show up to say good night? Yep, she shut me in the closet! She didn't come and look for me. Usually if I don't show for the good night, she finds me. She didn't! Guess she didn't want to get her lazy self out of bed when it was a cold night. So in the morning, I have been playing with a lamp on the table in the room. Her wake up call as it were at zero dark thirty. Here I am at a previous time checking out the lamp. So she hears noise and I hear "Derby, get down". Well, I wasn't up on anything to get down off of. Finally her brain engages enough to realize the rattling is not me and the lamp, but the closet door. So she rolls out of bed, expecting to see me on the outside of the door. Nope. So she cracks the door open and out I come. About time lady! I headed off to the litter box and then got an early snack of crunchies. Don't let this happen again or you may find a few, ahem, prezzies on the closet floor. We didn't win Eric & Flynn's contest for cute cats. Close but no nip cigar. The big winner's in Eric & Flynn's contest will be the shelter that gets all of the litter from Verdo for the next year. We lost out to Punapippuri those wonderful cats of the north, way up in Finlandia! They chose a no kill shelter in the UK called, The Moggery, to get the litter supply. Well done! Waffles Too, over at Glogirly won the US side, getting a gift certificate. That kitten has promise. 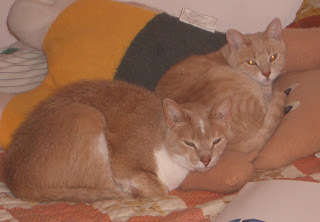 We submitted an outtake from our header shot, snoozing in peace on the back of the couch. But do you notice what is in common with the top vote getters? Yep, gingerness. Hard to beat us gingers! We gingers rock. Mum found some new backgrounds for the blog. We thinks they are OK. We put up one for Valentine's Day. That will be coming soon. Hope you like it. We continue to try to stay warms. Mum even kept the coverings over the big windows closed to help keep in the warmth from the heaty monster in the dungeon. Mum only stuck her nose out long enough to bring in the newsy paper. Heck, we even decided to share the little bed to help keep us warms.We should only have one or two really cold days yet, then back to normal. Right now we don't have to worry about that with mum. She doesn't stay in the sleepy spot really late, but we do jump up to make sure she is getting out and putting out our morning foods for us. Even though she doesn't have to get up and go day hunting right now. 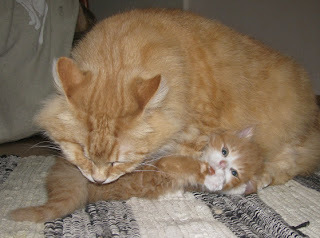 Oh yeah, as a lark we entered Eric & Flynn's contest for cute cats. Today is the last day you can vote. Gotta get your vote in by 7 PM Eastern Standard Time, that would be 4 PM for those cats on the left coast. We decided that if we won we would give the cat litter, a whole year's supply, to a shelter in the UK, versus taking a gift certificate at Nip and Bones for us. So go here, check out the cats and vote, hopefully for us. It is furry cold here, we are snuggled on our blankies and hanging out with mum. It is cold here, the heaty monster in the basement is working hard to keep us all warms. Mum is going out to lunch today. We will stay inside and cuddle up to stay warm. Just chillaxin' with mum. Getting my loves. Stay warm everyone. It is supposed to get furry cold here in the next few days. We will stay in and be warm. Mum continues on her quest to clear stuff out make things nicer for her and us. She got to moving the stuff around. Desk from just inside the door to the far corner, but our table is still in front of the window so we can see out. Grampie's big old filing cabinet to the opposite corner. Bed from being against the wall to sticking out. The little file cabinet sitting where the desk was, but once mum gets it empty, it will be gone or repurposed somewhere in the house. Looking from the desk to the door. Mum got some of these, she just put them under the desk and filing cabinet, then she could push them around without hurting herself. Yes, Trout Towne Tabbies, mum knows to take the heavy drawers out to make them lighter. Mum can get at both closet doors, she is happy about that, cuz at some point that has to get cleared out too. Checking out the new spaces. Mum even got one of the drawers all cleared out from the small filing thing. That big white basket is nearly full of papers that need to get shredded. But with moving things around, mum can actually plug in the shredder again! Mum will continue working on more of this today. Probably get the little filer cleared out and moved. Then she may take the weekend off to do her regular chores. Mum reading a book, she does that lots. Do you like her bookmark? It sorta looks like me. Mum put the Christmouse stuff away, but these two whiteish things showed up to sit by the clock. Gosh, however did that one fall over. I'll never tell. Mum is on her quest to get rid of the clutter and junk in the house. So she took a bunch of stuff to Mr Good Will today. This was mostly what she took out of Grampie's stuff. But the full boxes are gone and so much of the stuff is gone too. Doesn't look too bad, thanks for bringing one box back for me, you need to work on that pile of shredding. Derby and I can't help with that, no claws remember! Then she came home and attacked some of her stuff in that little chest of drawers. Most everything was just junk, stuff that got tossed in to get it out of the way. A few things had value. Mum found all of her certificates saying she had graduated from school. Yeah mum, we know you went to school and that you are all sorts of educated. But then since that little piece of furniture is empty, it is going to go away. Mum moved it out and will be shuffling the furniture around. Says she needs to go to the store to buy some furniture sliding things to help her move the stuff. Besides here education certificates, she did find a cute little quilt that her Grammie made for her for her dolls. And her tassel cord from graduation, she thinks we can play with the tassels. Oh, as a reminder, this is what it looked like just after mum and Uncle Flip brought all the stuff and dumped it into the room. Yeah, a big improvement. Now we have room again.